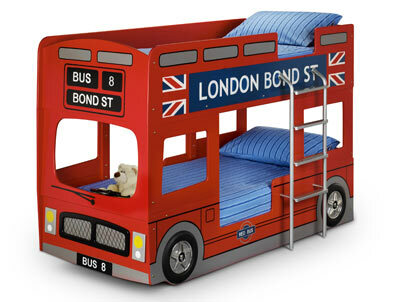 This great new stylish bunk bed offers a unique style as made to look like a traditional london bus in red it is decorated with london bond street signage and is made from mdf. The London Bus bunk bed will take 2 standard uk size mattresses 90 x 190cm not supplied and offers a stylish bunk bed . Like all bunk beds it is supplied without mattresses , we have added a option of a reflex foam non memory foam mattress which is 13cm deep or an option of a 18cm deep coil spring mattresss. These mattresses are an ideal depth for bunk beds and cabin beds for safety reasons. The bunk bed measures 200cm long x 108cm wide x 136cm high .